My parkrun journey today took me to Yeovil Montacute in Somerset. This is a little bit further than I would normally travel on a Saturday morning but I had three good reasons for going there .... well, two good reasons and one daft one. The first reason is that many years ago I used to live in this neck of the woods and I like to pop back occasionally to see how Somerset is managing without me. The second reason is that I have been told that Yeovil Montacute is one of the most scenic parkruns and when you see the photos I’m sure you’ll agree. The third reason is the most ridiculous. There is a thing in parkrun touring called alphabeteering, whereby you try to get on your record a parkrun starting with every letter of the alphabet. Thus far I have failed to notch up a ‘Y’ and so it was a choice between going here or to York ... and Yeovil was nearer! Montacute is an attractive little village near to Yeovil with a medieval church, some ancient pubs and lots of pretty stone cottages. It must be a good place to live because a recent report suggests that it is the area of the UK with the longest life expectancy. https://tinyurl.com/yd97lwru Adjoining the village you will find Montacute House. Built out of local Ham Hill stone, Montacute House is perhaps the outstanding example of a late Elizabethan manor house. It was built in around 1598 by one Edward Phelps, who was one of the outstanding legal minds of the era and who conducted the prosecution of the Gunpowder Plotters in 1605. The architect is believed to have been the mason William Arnold who was responsible for a number of grand buildings. After the death of Edward Phelps in 1614 the estate passed down through the Phelps family uneventfully until the nineteenth century when it fell into the hands of one William Phelps. William Phelps initially helped enlarge and improve the estate but then his behaviour grew ever more reckless and unpredictable. He was eventually declared insane and committed to an asylum but not before he had gambled away much of the family wealth. The Phelps retained ownership of Montacute House but could no longer afford to live there and so the house was rented out for many years. In 1929 it was offered for sale with an estimated value of less than £6000. It might have been demolished at this point, other fine houses suffered that fate, but it was eventually bought by a philanthropist, Ernest Cook, who eventually bequeathed it to the National Trust. Nowadays Montacute House is one of the more popular of the National Trust properties in the south west. Last year it attracted around 170,000 visitors. There is certainly plenty to see including some fine formal gardens. The Long Gallery is used by the National Portrait Gallery to show off some of its collection of Elizabethan and Jacobean portraits. Because of its general picturequeness Montacute House has been used as the backdrop for a number of films including the Libertine, Wolf Hall and Sense and Sensibility. The parkrun course takes place in the grounds of the estate, starting at finishing at the end of a long tree lined avenue. The course consists of a shorter lap, mainly up and down the avenue and then a longer lap taking in most of the perimeter of the park. It is mostly on grass, allbeit rather bumpy and uneven grass, and is undulating throughout with a fairly stiff climb towards the end as you come back up to the house. I’d rate it as a fairly tough course though some people, more adept at cross country than me, have managed some decent times on it. It also boasts some of the stupidest sheep I have encountered. I can understand them perhaps being spooked by the runners but what was happening was that the sheep on your right felt the need to dash over to the left and the sheep on your left had to dash over to the right. I saw several near misses between sheep and parkrunner! 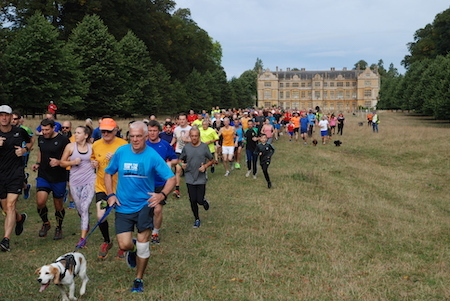 Yeovil Montacute parkrun has been going for a few years now and is a popular parkrun, especially with tourists looking for a scenic course or maybe just that elusive ‘Y’. There were 384 starters there today on a morning that was dull and grey with a touch of drizzle in the air. I wasn’t sure how well I was going to go today. I have been struggling a little in the past week with some soreness in the old joints. I’m sure the weather must have played a part - after many weeks of dry and warm weather, it suddenly turned cooler and damper. Sometimes it has felt okay, other times I have been limping slightly. I decided to take it carefully and see how it went. I was only about thirtieth after the first kilometre but gradually worked my way through. I found the uneven surface a bit tricky along with the marauding sheep! In the second lap I latched onto a small group who helped pull me round. I struggled a bit on the final hill and lost a couple of places but eventually crossed the line twelfth in 20:38. Not my best performance but that was okay. Actually it was quite good for a 61 year old with aching joints! I enjoyed Yeovil Montacute very much. It is one of the most scenic courses I have visited and there is a good atmosphere with all those tourists. It also has the advantage, which you get with National Trust properties, of having nice facilities including a café at the finish. My statistics for today ... that was parkrun venue number 174. I was first in my age group and third overall on age graded performances. More importantly I now have a ‘Y’ on my list. I’ll finish, as usual, with a YouTube video of a past event. If you’d like to see the course for yourself, here it is.